Students, local artists and community members volunteered on Saturday to restore a mural on the side of Victor Bowl to its original form. “The mural has been here for 20 years and (Manager) Brian Westerman of Victor Bowl contacted the college and asked if any students wanted to participate” in the restoration, Anna- Marie Veloz, an art professor at Victor Valley College, said. According to Westerman, the mural was created about 1989 when the owners of the Victorville bowling alley extended the building. It had since become marred with graffiti. “We’ve been working with VVC for the past couple months (since the damage) to coordinate this,” Westerman said. “We thought maybe (professors) could use it for their students … use it as a project as well as help us and help the community. It’s a win-win for everybody.” Joan Sowinski, director of Eclipse Gallery in Hesperia, was happy to see that the art community is alive in the Victor Valley area and she’s anxious for more. “The visual arts should be all over the valley and one day they will be and the restoration of this mural is one step forward to the appreciation of the arts,” Sowinski said. All five panels of the mural were damaged with red paint, mostly at eye level. “It wasn’t too high or low, however. 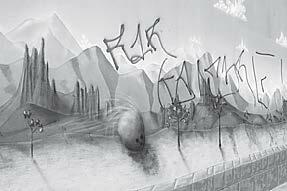 Where they graffitied tended to be in the transitions of different color schemes,” Veloz said. Victor Bowl provided the paint supplies and lunch to the volunteers for their contribution. Once the mural repair is finished the wall will be sealed with a coat of anti-graffiti paint, a layer that will protect against any future vandalism. “They hadn’t done (the protective paint) before, so we’re going to do it now,” Westerman said. 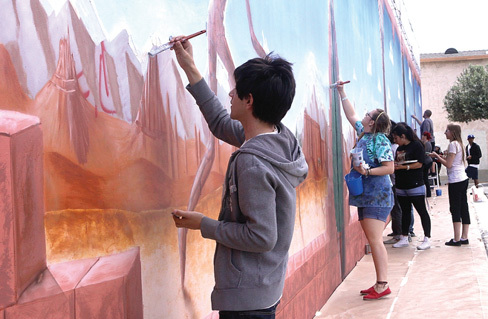 LAURA STREPPONE, PRESS DISPATCH RESTORATION: Victor Valley College students, local artists and community members work to restore the 20-year-old mural on the Victor Bowl building in Victorville on Saturday. Five panels were marred with red graffiti at eye level. LAURA STREPPONE, PRESS DISPATCH BEFORE: Five panels of the mural at Victor Bowl are damaged with red paint. The graffiti will be gone after the community’s efforts to restore the artwork.